Jeff Jefferson and Jerry Pitts, two veteran crew chiefs of the NASCAR K&N Pro Series in recent years, have acquired the assets of Gene Price Motorsports to form Jefferson Pitts Racing. Based in Naches, Wash. the team will field two full-time entries on the NKNPS in 2015. Jefferson and Pitts will continue to make crew chief decisions for their two-car team as Gracin Raz and Noah Gragson have been signed to drive for the newly formed organization. Each driver will be competing for the 2015 SUNOCO Rookie of the Year award on the NASCAR K&N Pro Series West with Jefferson guiding Raz and Pitts overseeing Gragson’s team. With a championship on his resume while working for Gene Price Motorsports (Dylan Kwasniewski, 2012), Jefferson has the experience to guide a young driver to the top of the standings, he added. Pitts brings three championships to the table as he led Greg Pursley to the 2014 crown while at Gene Price Motorsports and also scoring the 2011 and 2002 titles (Pursley, Eric Norris). Having worked with Jefferson in the past, building a team together has been a goal for some time. “Jeff has been at my side atop the pit box while at GPM, led Dylan to the title while working as a teammate, molded Cameron Hayley into a top driver during his time at GPM and overall is a talented crew chief. I knew that if he and I could put this together we’d have a solid team and could attract top talent to drive the equipment,” Pitts noted. Gragson has competed at the Las Vegas Motor Speedway Bullring where he’s among the top late model drivers at the famed-venue. 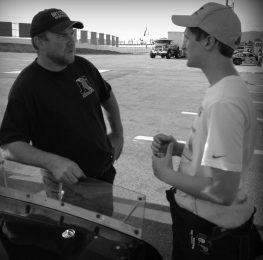 In addition, the teen is an accomplished INEX Legends driver after getting his start in the Bullring’s Bandolero division. Pitts expects a smooth transition for his new driver, he explained. Raz brings NKNPSW experience to JPR and will be an asset to his teammate, Jefferson added.